This Christmas give your friends and family the gift of fresh air fuelled fun with a 2019 day pass at the Ranch available to buy online now! 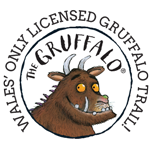 Perfect for Gruffalo fans to enjoy Wales’ only licensed Gruffalo Trail! Fairy Forest, Enchanted Wood where our beautiful Unicorn resides, Lost Boys Hideout, Willow Maze, Dillis the Dragon, Den Building, Ranch Football (BYO ⚽️), Archery, Tipi Village, Hobbit Hill, Tree Houses, Rope Swings, Climbing Tree plus much more! !